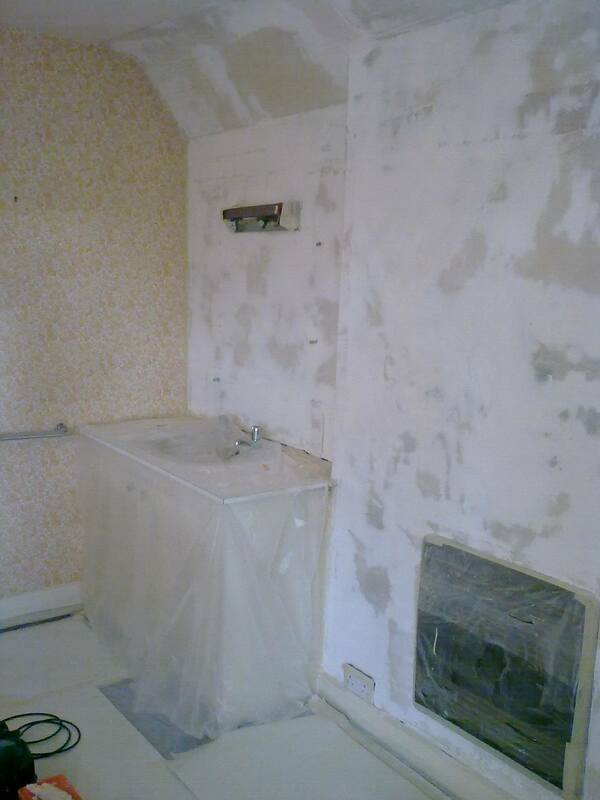 Problem 1 – This room had suffered from a leaky chimney breast which affected the plaster on the end wall. 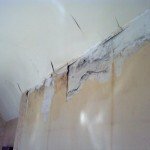 The damp leached onto the ceiling and over time mould had grown behind the wallpaper. The damp had also damaged sections of the lathe and plaster and cracked the lining paper on the ceiling. 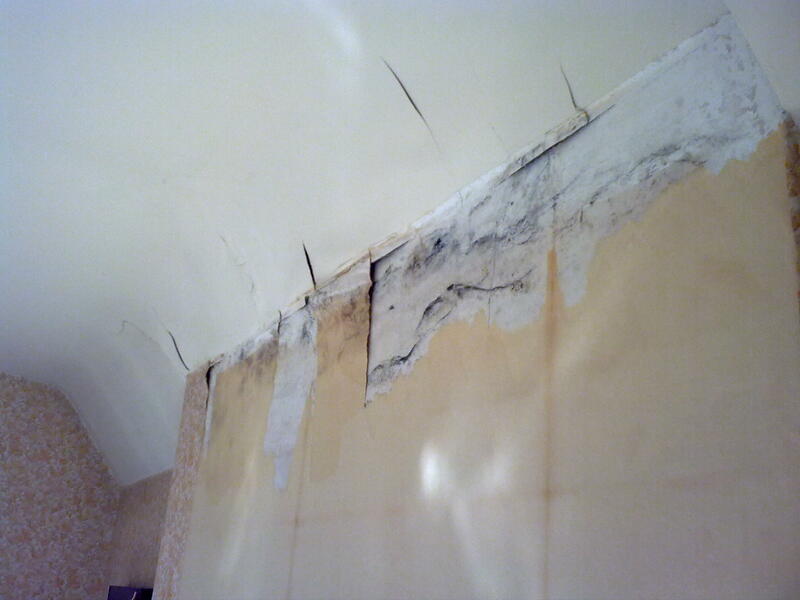 Problem 2 – The source of the water leak had been solved by Steve Evans a few years earlier, so it was safe to redecorate. 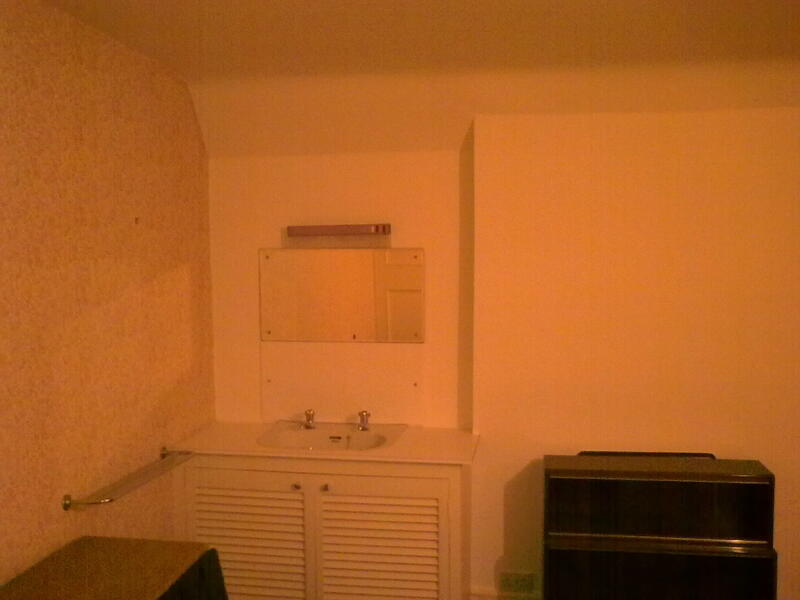 However, the customer did not want to redecorate the whole room, as it was in very good condition apart from the end wall. But it was tricky to know where to draw the line, because the ceiling sweeps down and there is no defined stop-start point for the damage. Solution – We decided to strike a line where the ceiling started to curve down. 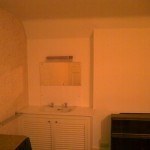 I then stripped a small section of lining paper from the ceiling and removed the wallpaper from the end wall only. 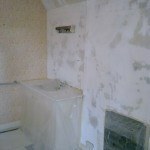 Filler and sealer – The damaged plaster was carefully cut out back to the lath, the bare plaster washed with bleach and left over night. Next day I painted the surfaces with alkali resisting primer, which binds any loose plaster and seals water borne stains. Then I filled everything a couple of times, with Polycell trade filler, sanded, and sized the walls with Beeline Primer. Finishing – I lined with 1200 grade lining paper hung horizontally. The joint between the new and the old lining paper on the ceiling was primed then filled and sanded a couple of times until it was all but invisible. The ceiling and end wall were painted with a couple of coats of Dulux vinyl matt in a colour to match exactly with the background colour of the rest of the wallpaper. Couple of trade tricks – To make sure I get a sharp joint where the new painted lining paper meets the existing wallpaper, I ran a bead of decorators caulk down the joint. I then stuck low tack tape on the vinyl wallpaper and painted a straight line. Sorry about the flash, its these dark nights closing in!